“It’s Just A Sign, It Doesn’t Have To Be Professional.” …Oh, Really? From the business card in your pocket to the digital billboard you see on the highway while going to work, signs are so much a part of your everyday life you take them for granted. Outside to inside, lobby to office, in the home, everywhere, signs are there to announce, inform, direct, warn and guide. Signs are a visual, non-verbal way to communicate and not just by the words alone. The type of sign, location, choice of font or letter style, sizing, layout and design all play a part in getting the message and your best image across. It’s not just a sign – it’s tells others who you are and if designed correctly, will attract the type of client you want. I have a friend who decides where she will eat if she likes the sign outside. If it’s neglected, she wonders what else is being neglected. This applies to all the signage you have in your business. Does your print material reflect the type of business you do? A comic book store will likely suffer using signage that a funeral home would use and vice versa. A comic book letter style and super hero are as out of place as somber tones and lettering are for the comic book store. Where do you go and what do you look for when searching for a graphics professional? Often word of mouth is a good way to start but don’t stop there unless they make you feel welcome and comfortable to discuss your needs. A full service sign company can save time and money if they fit. They can design and produce the final product without having to search out a company to produce your sign. A good relationship should form and they can provide other types of signs that follow your look without having to repeat the introduction process. If you want a logo designed, determine the purchase price of the design package so you can own the artwork. This is standard in the industry and should be discussed prior to work being done. This will allow you to take and use your artwork freely. Remember it is your business and you are the driver, so don’t be intimidated if it doesn’t work for you. If you work with the designer, you should be asked a variety of questions including the type of client you want to attract. Yes, that is what a sign can do by the way it is designed. All you have to do is watch TV advertisements to see how that works. Other questions include a discussion of the following topics: Type of sign, where will it be located and mounted, what are you trying to say and conveying the message using the visual clues of font style, colors and images. The type of sign is determined by the purpose and what you want to say: Large format printing, posters, banners, A.D.A. interior signage, real estate site signs, traffic signs, business cards, engraving, raised lettering, cast bronze plaques, flags, specialty items, vehicle lettering, car wraps, window lettering, labels, decals, magnets, directories, trade show, floor graphics and custom items all have different properties and uses. It is amazing to think that many weren’t in existence even 20 years ago. New products are coming out all the time. What distance away from the sign will viewer stand? How will it be mounted? Please check with your township for the appropriate permits and regulations for exterior signs. A.D.A. (American Disabilities Act) signage with raised lettering and Braille II translation also have specifications for production, installation and use. This is where your message will work or fail. The layout of your message is influenced by many considerations including purpose, fonts or letter style, graphics or icons, color and size. If your message is to announce your place of business, then it is important to be visible from the street quickly – so cars passing by can see the sign easily within the few seconds they pass by. Remember, this applies to vehicle lettering as well. The back door is a “billboard” and gets the greatest length of viewing time from the people traveling or stopping behind the vehicle. Drivers pass by the sides quickly, their eyes on traffic ahead. This valuable “real estate” needs to be optimized for quick viewing. Window lettering, banners, interior placards, business cards and brochures are saved for more detailed information. Traffic, parking and warning signs are designed to impact immediately and are simple and direct. Handwritten signs are pretty much a thing of the past except in “back in 5 minutes” type of situations. Do not confuse this with professional hand lettering, almost a lost art in the industry and highly prized. The office printer is common place and can be forgiven to be used as temporary signage. After a short period of time, the sign should be removed or replaced if the message is a permanent one. Temporary signage gets tattered, worn and generally lacks the authority of your company image. There is more to it than just written words. It’s opportunity for prospective and current customers to identify with your business and image. An experienced, professional graphic designer and sign maker will make your signs work for you. So it isn’t just a sign. Really. 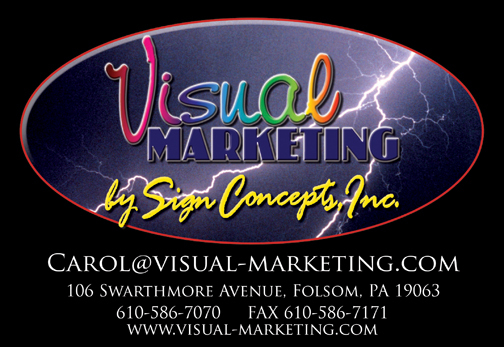 Visual Marketing by Sign Concepts, Inc.